This is a beautiful, combined pent shed with lean-to greenhouse. Featuring two door access, the building comes with some outstanding features and supplies brilliant value for money. All of the windows on the shed and greenhouse are styrene glazed. This means they are completely shatterproof and much safer than single glazing. What we really like about this building is its 2-in-1 design. Unlike some other similar buildings, this one still provides a large amount of storage. The greenhouse feature doesn’t cut too much into the general storage space available. 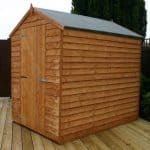 Made with 12mm tongue and groove cladding, the entire shed has a solid and very sturdy design. It is factory dip treated before being shipped to ensure it reaches you in perfect condition. There is also a 10 year anti-rot warranty supplied with the building, though terms and conditions do apply. This isn’t just aesthetically pleasing; it also comes with great security. The lockable greenhouse door is a great feature, while a padlock can easily be fitted to the pad bolt attached to the shed door. It also benefits from a fantastic modular design, meaning you can alter the panels around to fit your preferences. 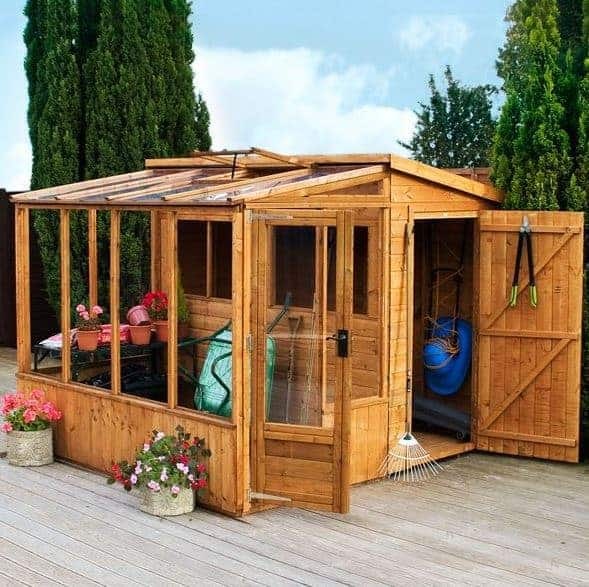 All in all we highly recommend this to keen gardeners looking for a space-saving combined greenhouse and storage area. High initial cost, though it does provide excellent value for money. This is a 2-in-1 greenhouse and storage unit with an incredibly attractive, modern design. 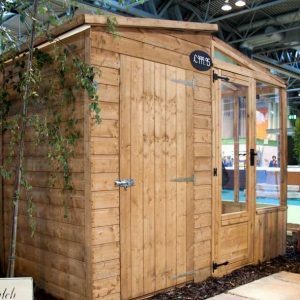 The units are completely separate from one another, with a single glazed door leading into the greenhouse and a single wooden door leading into the shed. 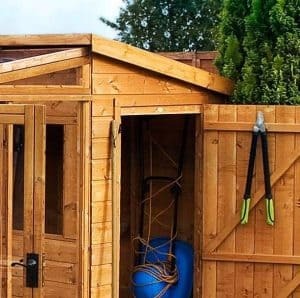 The storage area can be used for gardening essentials as well as general storage, whilst the greenhouse is designed to grow flowers, produce and plants. The greenhouse could also be used to store non-valuable equipment such as wheelbarrows and compost. The roof height on this building is taller than most pent sheds. The greenhouse measures slightly lower than the actual shed, fitting comfortably underneath the eaves. Its additional height makes it possible to store tall tools such as rakes, shovels and fishing rods. However, whilst the height of the actual building is taller than most, the height of the door is slightly shorter. You’re still given a good level of height to enter the building, but it’s still worth noting. What we do like is the slightly wider door design. This makes getting bulky equipment in and out of the shed a breeze. As you would expect, the width and depth of the building is larger than standard storage sheds. This is obviously to accommodate the attached lean-to greenhouse. So we’d recommend you properly measure the garden to check it can comfortably accommodate the building before you buy. We’re delighted to see the roof and floor both feature 12mm tongue and groove construction. 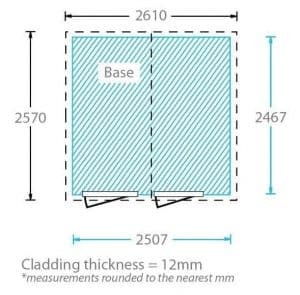 A lot of the time we find that whilst manufacturers use Shiplap tongue and groove on the walls, they cheat you a little by using solid sheet materials inside the building. This basically saves them money, but the materials aren’t very strong so they don’t provide an overly sturdy base. 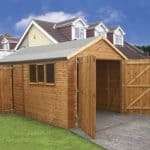 Sheds such as this one which feature tongue and groove roof and floor are considered the highest quality models available. The floor in particular offers an excellent amount of strength and will support any weight. So you could store heavy equipment and tools in this shed without having to worry about breaking the floor. The roof on the shed is different to that on the greenhouse. For obvious reasons, the greenhouse comes with a glazed roof. It also slopes down towards the front of the building. The roof on the shed is covered with a heavy duty mineral felt and slopes towards the rear of the building. So you end up with a similar look to apex, whilst getting the space saving benefits of the pent roof. With 12mm Shiplap tongue and groove cladding, this is a high quality shed. It offers a water-tight, interlocking build which also protects the inside of the building from drafts. 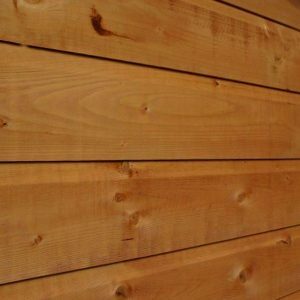 There are plenty of benefits that come from Shiplap cladding, including the fact it looks good. This is down to its smooth, planed finish and tight-fitting design. Something else you will notice if you look closely at the panels is that they have a small groove. This plays an important role in water-resistance. As rain hits the cladding, it is channelled away from the timber, down onto the floor. There is also the tongue and groove aspect that provides numerous benefits too. 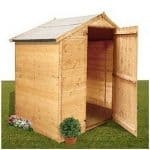 Firstly it is the tongue and groove which gives the shed its strong interlocking quality. 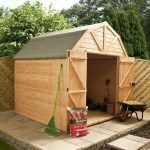 However, it also makes the shed easier to erect, as well as protecting the structure. The panels come with a tongue at one end and a groove at the other. This unique design causes the panels to just lock into place. Think of a laminate floor and you’ll get the idea. Then there’s the expansion gap. This is responsible for protecting the structure if the timber warps. Moisture and temperature changes that naturally occur throughout the year can cause the wood to swell. If there wasn’t an expansion gap, the change in the timber could lead to structural problems. So the tongue and groove construction plays an important role in just how stable this shed is. Wooden 28mm x 28mm framing is used throughout the interior. This is found on most sheds and Waltons have also planed and rounded it to add a safer, smoother design. 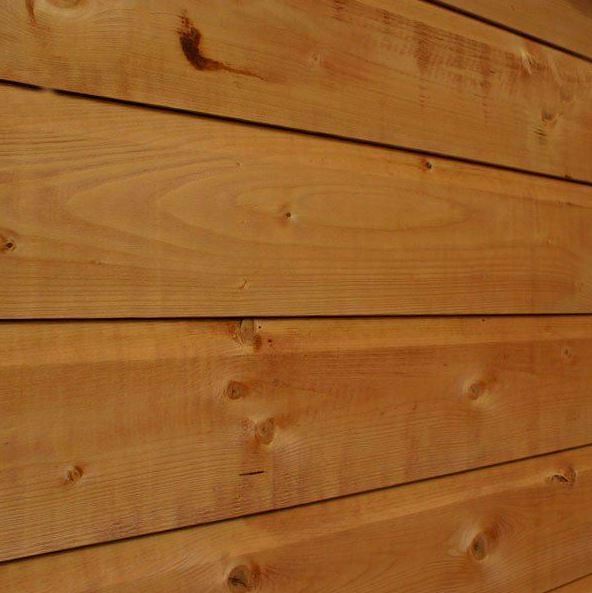 As the Shiplap cladding is so thick and naturally durable, you can benefit from not having to treat the shed annually. This will depend entirely upon the type of treatment used, but a good quality preservative can protect the building for more than a year. This is great news if you’re not a fan of regular maintenance. It absolutely needs to be treated once it has been erected. However, your chosen treatment type will determine how frequently you have to maintain these treatments thereafter. The first treatment type which tends to be pretty popular is a water treatment. Perhaps the main reason why these are so popular is because they come in numerous finishes. They provide a quick and easy way to change the colour of the building, whilst also protecting it from the elements at the same time. They leave a water resistant barrier on the surface of the wood which roughly lasts around a year. The second treatment type is spirit treatments. These come at a higher cost and there aren’t as many colours on offer. However, they are a lot more advanced in the way that they work. Rather than just leaving behind a surface barrier, the treatments penetrate into the building, forming an interior barrier too. If you’re looking for minimum maintenance then this is the type of treatment you need. You do need to be aware that the great 10 year anti rot guarantee supplied with the building does require you to keep up with the treatments in order to remain valid. As the building is split into two units, there are two single doors included in its design. 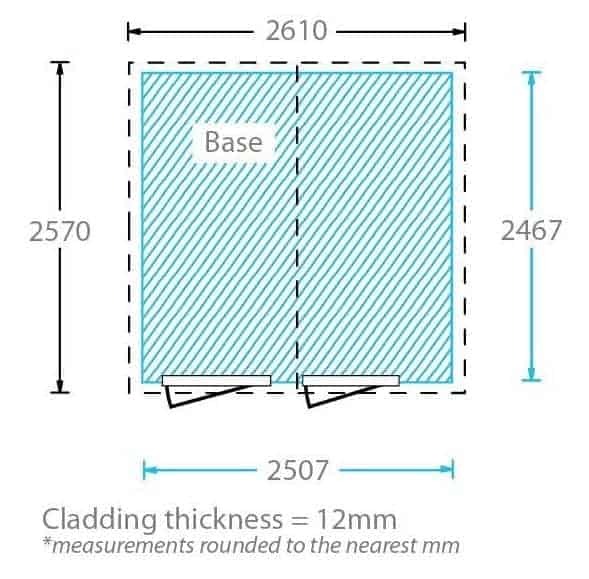 The shed door has a very strong, braced design which stops it from becoming damaged through daily use. It is fitted with a pad bolt so you know the door will stay shut even in the strongest winds. The greenhouse door on the other hand, features a glazed design and comes with a more secure lock and key. It has a wooden panel at the bottom, just like you often find on patio doors. The styrene glazing is strong and ensures the greenhouse benefits from the maximum amount of direct sunlight. There are many windows on this building as you can imagine. However, it isn’t just the greenhouse that comes with large windows. The shed itself also comes with numerous windows. This means both units benefit from a large amount of natural sunlight. We find the security of this building really impressive. As every part of the greenhouse is exposed because of the large windows, the lockable door is an important security feature. It comes with a key, so only you have access to the building. All of the windows are also glazed with 2.5mm styrene. This means they are not only shatterproof, but they are also stronger than single glazing, making it more difficult for thieves to break in. As the greenhouse will largely be storing non-valuable items anyway, potential thieves also won’t be as tempted to break in. The shed isn’t as secure, though the pad bolt does enable you to attach a padlock which would significantly increase its security. 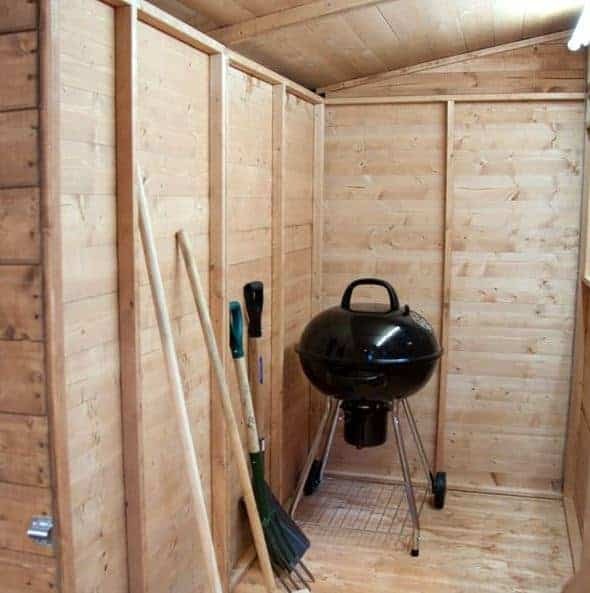 One thing we really love about the design of this building is the fact that the shed area comes with fantastic privacy, despite having windows. This is because those windows are covered by the greenhouse. So whilst natural lighting can still filter through, nobody will be able to see what you are storing in the shed. It gives you the benefits of a windowless shed whilst providing a lot of natural light into the storage area. It’s always good when a building offers unique customisation options. As well as the common extra strength floor support pack and superior duty felt, you can also choose to add an auto vent onto the greenhouse. This auto vent is incredibly simple to install and can be fitted in literally a matter of seconds. It helps you to regulate the temperature inside the greenhouse and you can set it to open at different temperatures. It comes with a polyester powder coating and it can lift a vent which weighs up to 14kg. It can open up to 14 inches and is built to be corrosion resistant. The superior duty felt is also a worthwhile upgrade. Heavy duty sand felt is great, but it does perish. The superior felt on the other hand is made with fibreglass, meaning it doesn’t break down over time. It’s also available in two colour options, allowing you to slightly alter the overall style of the building at a really low cost. Finally the extra strength floor support pack could be useful for the shed, but as the entire building benefits from tongue and groove materials, it really isn’t a requirement. Two very useful extras are available. The first is the Lifestyle Greenhouse gas heater. This 1.9kw heater is a great way to keep your plants heated throughout the colder, winter months. It doesn’t cost much to run and can be seen as an essential if you’re a keen gardener and you like to grow your plants all year round. The second extra is the 4×2 pressure treated wooden vegetable trough from Waltons. This is an attractive little trough designed to help you grow various vegetables. You can also use it to grow flowers in. It has a raised design, keeping the plants off the ground. This is also a good feature for gardeners who suffer with back problems as you won’t have to kneel or bed down as far. This is an extremely impressive high quality building and it benefits from a modern, attractive design. Both the interior and the exterior of the unit have been designed to exceptionally high standards. Longevity is one thing Waltons have focused on with this combi unit. 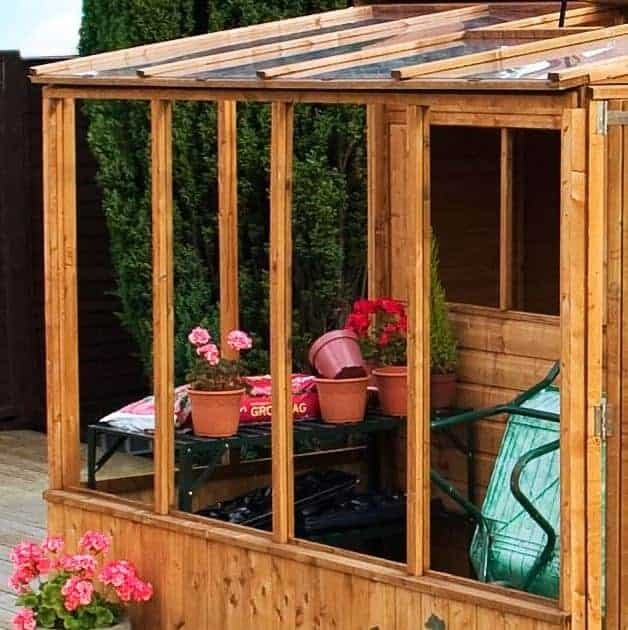 The greenhouse has been constructed with shatterproof, tough styrene glazing, whilst the storage area is made from Shiplap tongue and groove cladding. Even the roof and floor contains tongue and groove construction, helping to boost its overall durability. As the building isn’t just designed for general garden storage, it doesn’t offer the same amount of floor space as a dedicated wooden storage shed. However, there is still space within the greenhouse to store compost, a wheelbarrow and other essential gardening equipment. The assembly of the building is straightforward, but some of the panels are very heavy. So it is going to be a fairly hard labour job. It’s also going to take time to build due to its split design. The features included and the few extras needed to get the most out of this building give it exceptionally good value for money. Final Thoughts: You’ll struggle to find a more attractive, high quality combined greenhouse and storage shed. This modern building comes with a whole host of brilliant features. The shed part of the building benefits from a high level of privacy, whilst the greenhouse comes with large, styrene glazed windows. The door and roof of the greenhouse also have a glazed design, ensuring maximum amount of direct sunlight filters through to your growing plants. Both buildings feature a pent roof, ensuring great waterproof protection. 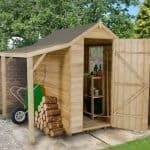 With the 10 year anti rot guarantee you can be sure this shed and greenhouse combo is truly built to last. All in all it is an exemplary building which is bound to look fantastic in any garden.